Despite being nearly 90 years old, the Royal Flying Doctor Service in Australia places technology at the heart of what they do. 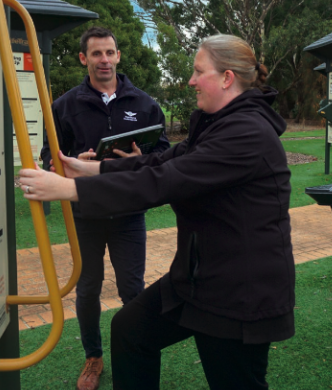 Read about how their team uses Physitrack to deliver healthcare and how it landed them a nomination for the prestigious Business Excellence Awards. The Royal Flying Doctor Service is one of the largest aeromedical organisations in the world, providing extensive primary health care and 24-hour emergency service topeople around Australia over an area of 7.3 million square kilometres. Their Tasmanian team recently started delivering a range of rural primary healthservices in northern Tasmania, working with local doctors, hospitals and community organisations to identify what extra assistance people living with chronic healthconditions might need outside of care delivered by their GP. Services range from physical exercise programs to assistance from mental healthworkers (often delivered in people’s homes) with the four main target conditionsbeing Cardiovascular disease, COPD, Mental Illness and Dementia. Face to face consultations are usually ideal, however RFDTAS also started rolling out Physitrack to support participants in between visits. Physitrack allows participants to follow their lifestyle modification plan (consisting of exercises and educational content) as set by the physical health worker via the free PhysiApp client app. This helps them self-manage their condition while reporting back on their progress to the worker in real time. The health outcomes, including outcome measure results, can be assessed and the program modified by workers to continually improve participants' health in between visits. Physitrack's built-in Telehealth video calling feature also allows the RFDTAS to reach an even greater number of participants, especially those living in remote areas or otherwise unable to meet a health worker in person. This initiative was recently acknowledged by the Launceston Chamber of Commerce as the RFDTAS was nominated for the 2017 Business Excellence Awards in the Innovation category. The judges were very impressed with the program and how using technology like Physitrack is making a significant difference in better engaging participants and helping them achieve better health outcomes, whether face-to- face or remotely. We congratulate RFDTAS with this fantastic achievement.